This is my fourth look at some of the Canadian and Commonwealth troops produced by Ultracast. 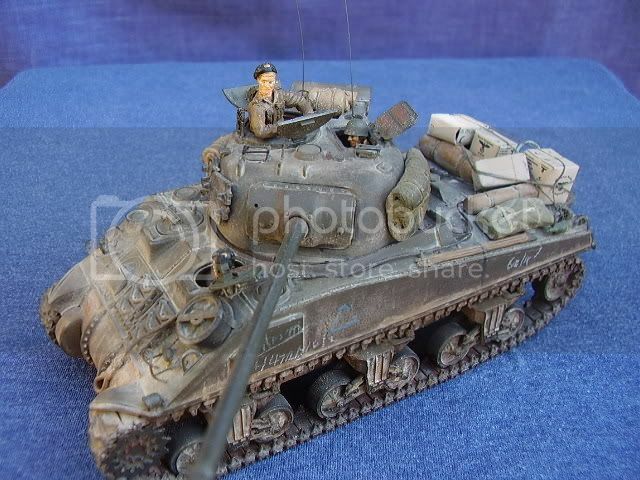 This time a figure set specifically designed for the DML Sherman Firefly (kit #6031), although these figures should work well in any British or Commonwealth small hatched Sherman. The set comes in a sealed plastic zip bag, together with a cardboard backing card. On the front of the card is the makers name and a description of the figures inside. On the inside of the card is a good quality colour picture to help assist in painting and assembly. On the back of the card are the makers details. This figure was sculpted by Kevin McLaughlin. At the bottom on the back of the card are a small set of instructions detailing steps 1 to 4 of the simple assembly process together with a Health and Safety warning about working with resin. Inside the bag is a single full figure for the tank Commander, and two ½ figures for the driver and gunner. Cast in a light cream resin the quality of the casting is excellent and as a bonus you get 5 heads for the 3 crewmen. The pour stubs are quite big but this should make for easy removal as the attachments are quite thin. Designed to be leaning forward in the cupola of a tank with his elbows resting on either side of the turret ring. This is a full figure, bent forward at the waist and leaning slightly to the right. His right leg is placed slightly forward of the left and both from the picture in the kit, and pictures of the built figure I have seen, he should sit well in the turret of a Sherman. His arms and head come as separate items. He is wearing what appears to be a 37/40 Battle Dress Blouse with the pleated chest pockets and hidden buttons, BD Trousers with Anklets and Ammo boots. The top right hand pleated trouser pocket looks a little low and too far round to the right. The ammo boots and anklets have good detail. Around his waist is a 37 pattern belt with a side arm on the right hip and an ammo pouch on the left hand side of the belt. The brasses on both the front and rear of the belt are well depicted. Under the BD he is wearing a jumper. The detail in the overall body is excellent and the pose looks fairly natural, he looks to be quite a strong, thick set individual. You have a choice of 5 heads, the one depicted in the photo shows that of a more mature and stern looking individual, looking off to his right. The choice of course is yours. The detail on the head(s) is excellent and the faces should paint up very well. Bent at the elbow with good cuff detail and well sculpted and detailed hands. Overall, a really 1st class looking Tank Commander. Coming as a full figure he could well be used outside the vehicle, depending on how much imagination you use. These are both ½ figures with the arms (but no hands) straight down the side. Both are dressed in 37/40 Battle Dress open at the neck, and around the waist they are wearing a 37 pattern belt, but end just below that. The uniform, belt/brasses and part holster are all well depicted. As far as I can tell both figures have the same upper body. As previously mentioned you get 5. All are well detailed with a range of facial expressions, and all come with a Tankers Beret with one wearing ear phones. I particularly like the Ultracast heads, a choice is always welcome and these are all very appropriate for Commonwealth Tankers. One of the heads is shown wearing his beret high back on the forehead and might make a nice Polish chap. Another excellent and very useful set of Canadian/Commonwealth Tankers. Excellent casting, with minimal clean up required these will populate any Sherman well. I like the bulk of the Tank Commander and the choice of 5 heads is great. The ½ figures are not my favourite, but will be perfectly OK in any small hatched Sherman, as their arms will not be visible. It’s good to have a full crew in Battle Dress, I’ve use a set of these already and thought they were excellent. The set should be useable to depict any British/Commonwealth crew so lots of choice there. The detail should paint up very well indeed, a quality on par with Resicast. I often think these figures paint themselves!! Highs: Excellent casting, the full figure commander could have extra uses and the detail is 1st class. Should fit any small hatched Sherman and give you an excellent crew. The extra heads give more choice of finish. Lows: The Exchange Rate at the moment, and maybe a little bit pricey given that the set has 2 half figures. I did. I saw it and assumed I'd read it - mixed it up with your Tankers in denims review Good set. I don't have them but I'm slowing collecting all the resicast Tankers. Thanks for the review.